Retailers only let you pre-order it for Bethesda.net. 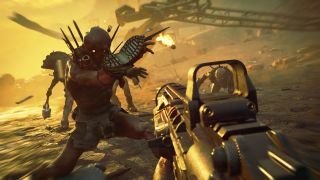 Following Fallout 76's exclusive launch on Bethesda.net, it's looking like Rage 2 could be the next game to land on the publisher's own platform first. There is no listing for Rage 2 on Steam, and third-party retailers that let you preorder the game like Green Man Gaming and Fanatical list the platform as Bethesda. Fanatical even goes out of its way to make sure you know you're not buying a Steam key, with this notice near the top of the page: "Please note that the key provided is a Bethesda.net key and not a Steam Key." Bethesda itself has the game up for preorder too. While other games on Bethesda's store like Prey and Fallout 4 mention 'Steam DRM' in the box where you click to buy, Rage 2's listing doesn't. I can't say I have any particularly strong opinions on the Bethesda launcher, other than being put off by an issue that caused the Fallout 76 beta to be deleted and require redownloading. As far as I can tell, Bethesda hasn't commented on this over the weekend when discussion of this started doing the rounds. I've reached out to clarify whether or not this will just be released on Bethesda's launcher. Would this affect your decision to buy the game either way? Let us know in the comments.